When I rented a car at the Tulsa airport, I knew I was dealing with an officious company when I told the clerk my phone number and said she needed two. “I only use a mobile phone,” I lied. (“I could just give you a fake number,” I thought.) I gave her an old number. Then she demanded a street address. “But my credit card goes to my P.O. box,” I said. I only give out my post office box when I’m dealing with strangers away from home. It’s even on my driver’s license. “Steal the car?” I finished. “I could just give you a fake one.” I really said it this time. “They make me take it,” she confided. She was young and sweet, probably wanted a nap, and all she was missing was a wad of chewing gum to smack. I smiled and we laughed together. I couldn’t blame her for this invasion of my personal details. She was merely the legally ill-advised foot soldier. “Yeah, and they just need proof that you filled up with gas,” she said. She shrugged. I signed. Vexed as I was by this triple presumption of guilt by Thrifty Rental Car, and as annoyed as I am to be forced, DMV-style, to prove my innocence through unnecessary paperwork, I needed the car I had reserved. I’ll assume other annoyed customers like me submit for similar reasons. “This makes me just want to use Avis next time,” I said with an outward laugh. Down at the pick-up desk, I asked a second employee how long this rule had been in place. Not only was this second explanation wormy — so which was the real reason? — but it also made no sense. (Whenever the phrase “for your convenience” appears, you can bet it’s to mask the real reason, which always benefits the company instead. When you hear that, scrutinize.) 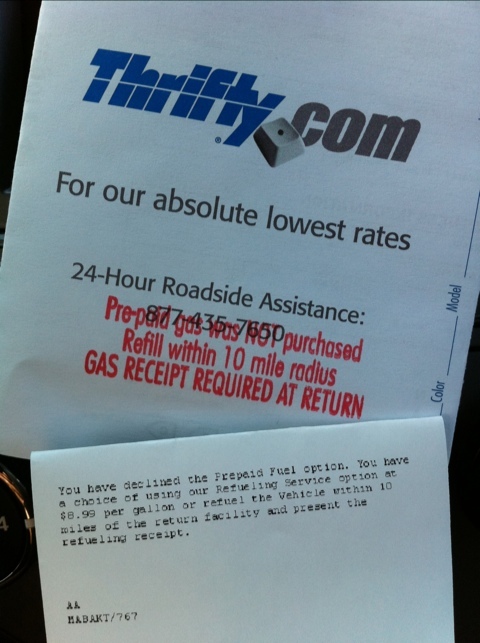 And in this case, having a receipt would not prove the tank was full, only that gas was purchased at some point. I was given no time parameters for when I’d have to get that receipt, after all. Update: I’m hearing reports that Avis does this now, too. Which other renters also do? Update to that update: That Avis demand was just a rumor. Looks like Thrifty/Dollar stands alone. Update 2: When I returned the car, the clerk didn’t ask to see it. She also didn’t check the mileage or the fuel gauge. Her computers were down so she virtually waved me through. I WAS TOLD THAT MY TANK WAS ONE GALLON SHORT WHEN I RETURNED IT. I DISAGREED AND WAS TREATED LIKE A THIEF EVEN THOUGH I HAD ALREADY SPENT 439 DOLLARS THERE. VERY POOR SERVICE IN BURLINGTON VERMONT AND MY CARD WAS CHARGED 31.64 FOR GAS AFTER THE FACT. SOUNDS LIKE THIS COMPANY IS HAVING A LOT OF PROBLEMS. WILL NEVER RENT THERE AGAIN. WAS TREATED LIKE A THIEF AND A SCUMBAG. I AM THINKING OF TAKING THEM TO COURT FOR CREDIT CARD THEFT FOR CHARGING THE GAS WITHOUT MY PERMISSION. Are u kidding? U don’t want to give your personal info? Let me ask a question, what would a bank say if you asked for a 20 thousand dollar loan and said “but i don’t want to give any personal info”. I think we both know what they would tell you. Companies need to take precautions on everyone that rents a car. No offense to you, but they don’t know you or what you might do to that rental car once you leave the lot. The public, in general, will lie right to your face to get out of paying for something. “Must of been like that when I picked it up” or “I don’t know how the bumper went missing” are some common things that you might hear at a rental desk. Oh yeah good luck to John on the lawsuit. Most likely the legal contract that you signed allows the company to run your credit card. They don’t have to ask your permission because they already have it when you hand your card over and sign the contract. Thats why they take your card at the beginning of the rental. How many people do you think would freely hand over their credit card for damage? I’m guessing you work somewhere in service, because you say “the public, in general, will lie right to your face.” And because you’re not really hearing what I’m actually saying. I don’t have trouble giving my personal information. Giving a credit card is not the problem — in fact, it’s the car company’s insurance against any of the Lying Public from putting water in the gas tank. It’s because I’ve supplied a credit card and full identification that the car company shouldn’t have to police my personal schedule once I have the car. Credit card companies have a wee bit more information about account holders than their mailing addresses. How freely do you think the credit card company gives up your personal information?